Maarit Lalli on suomalainen elokuvaohjaaja, -tuottaja ja käsikirjoittaja. Lalli's first feature film Almost 18 won the Jussi Award, the Finnish equivalent of the Oscars, for best screenplay, best film and best director in 2013. Before her first feature film Almost 18, Maarit Lalli directed several awarded short films. Lalli has also worked as a writer for the hugely popular TV series Kotikatu and directed the hit shows Käenpesä and Sydänjää. Set in the countryside, this short film tells of a father and his son, Finnish guts and stubbornness. The main characters never complain about anything and refuse to give up or admit to anything. This was Maarit Lalli’s professional directorial debut. The film won several international awards and was nominated for the European Film Academy short film prize in 2000. A film about a young couple at a time when remnants are all that remains of their love. The film is a declaration of love from a woman to a man at the time of their divorce. Remnants was part of the European Capital of Culture short film project in 2000. Legio is a film about soldiers whose life mission is carrying a door. One morning the squad gets saddled with a rookie that the soldiers are not too happy about. Maarit Lalli's first film school production, based on a dream Lalli had of Roman soldiers. The film won the Napinpainajat award for the strangest Finnish short film at the Tampere Film Festival. A comedy that separates the sleds from toboggans. A film within a film, this is a film about film school. Film students ironize themselves and their education; the history of Finnish film schools isn’t spared either. We see Krzysztof Kieślowski, a visiting scholar at the time, shivering in a cameo role. 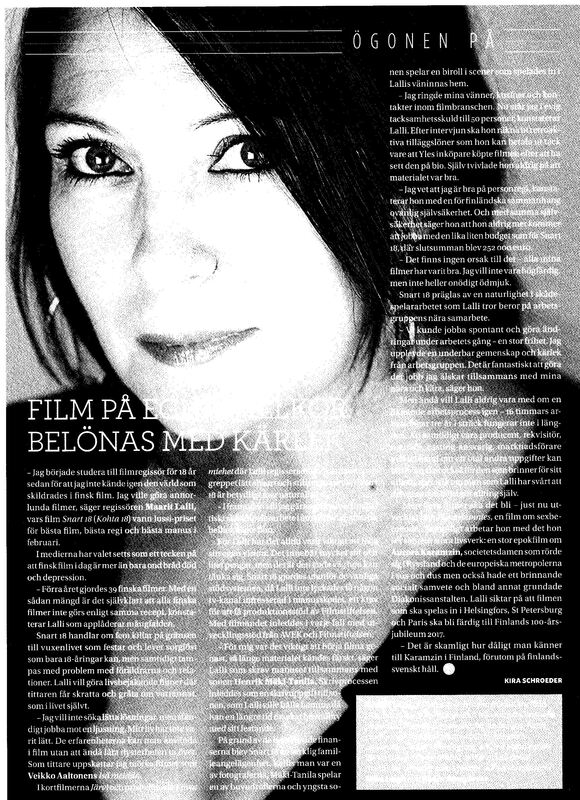 Axis was the very first film made by Maarit Lalli and her fellow students at film school in their first year. The film enjoys cult status in Finnish film. On a summer night, sisters Henna and Mailis are rowing a boat on a lake. Henna has lost something in the lake and needs it back. The Lake got an honorary mention at the Helsinki Short Film Festival in 2006. Niko, 15, plans to forge his mother's signature on the school’s work practice program sheet and spend the work practice week at home, training for the moped license test. He gets caught and his plans are ruined; instead of riding his moped all day, he is forced to get a taste of a real job. Sway with Me won awards at the Arctic Fury film festival in 2010 and Artova Film Festival in 2011. With a series of incredible images, Prison and Paradise tells of today's Suomenlinna, a fortress island off the coast of Helsinki. The island is a UNESCO World Heritage Site and home to almost eight hundred people, but it also houses a prison. The island is a never-ending construction site where the main characters leave their marks. In the film, an old man, a little boy, an Italian artist and the wife of a late pastor tell about their relationship with the island; one of them never wants to leave and another could barely stand the island for two months.